You may know the name Craig Robinson because of his sister, former first lady Michelle Obama, and brother-in-law, former President Barack Obama. The New York Knicks, however, hope Robinson will be better known for his role in developing their players. The Knicks announced the hiring of Robinson on Aug. 8, 2017, to serve as their vice president of player development and G League Westchester Knicks operations. Robinson was the final piece of a revamped and predominantly African-American front office with president Steve Mills, general manager Scott Perry, assistant general manager Gerald Madkins, G League Westchester Knicks general manager and former Knicks player Allan Houston, and player personnel director and ex-NBA player Harold Ellis. Robinson noted that each of his black colleagues has the résumé to boot. Robinson talked to The Undefeated about his role with the Knicks, the Obamas, the motivation one could gain from the groundbreaking Knicks’ front office, and more. You have a unique job with the Knicks. What are your duties? It’s actually two things. I’m vice president of player development, which means both on and off the court. I’m responsible for our players’ development. All 25 or so players when you count the New York Knicks and the [G League] Westchester Knicks. Their on-court development and overseeing the things that they’re doing that helps get them to be better players. The off-court player development, which is the life skills and stuff and things of that nature. Then my other job is I’m overseeing our G League operations. I’m basically running our G League team and overseeing what we’re doing there. The thought there is that our players are more vertically integrated. What the New York Knicks are doing we’re trying to get the Westchester Knicks to do, and some of the things we’re trying out with the Westchester Knicks we’re going to try and get our players and staff to try out with the New York Knicks. It’s a true developmental league. What kind of support have your sister and your brother-in-law given you in your transition and think about what you’re doing now? They’ve always been extremely supportive of what I’ve done. That’s always there as an underlying foundation. It’s a really supportive family. We support all of us. Everybody’s doing some interesting things, and we support everybody. They support us. My brother-in-law, Barack, the former president, is a huge basketball fan. He’s probably the most excited about my new position. My sister’s just happy that I’m happy and that my wife and kids are happy. I think Barack is very excited to see what we’re going to do with the Knicks. I had a two-year hiatus where I worked for ESPN for a couple of years. It was really during that time that I kind of took a look at the NBA. I didn’t know if the NBA would find someone with my background attractive that was mostly college and corporate America. What I would do was, when I was preparing to do my television job, if I was ever in or near a city that had an NBA team, I’d just call up the folks there and see if I could come by and just talk to people, network, which led to my first position with the Milwaukee Bucks. I met with [Bucks co-owner] Marc Lasry and he forwarded me on to [then-general manager] John Hammond. Those two were primarily responsible for my first foray into the NBA ranks. Once I was there, I thought I was going to be in Milwaukee for a little bit. Then Steve [Mills] called me with this opportunity, which was sort of a bigger role than the role I had in Milwaukee. It was literally that path that got me to where I am today. What did you learn from your first season in the NBA working for the Bucks? I learned a lot. First of all, it was shocking how much younger the league is up close than when you’re watching on television. I think you think of the NBA as these professional guys who are well-established, have been pro for years. While there are guys like that, most of the league is made up of young guys. That was one of the first things that hit me in the face that I had intuitively come up with on my own. The other thing, the amount of travel, which leads to the real focus being on rest and recovery, almost as much, if not more than actual practice once you get going in the season. It’s not like college, where you can come back home and get a few days of practice in before your next game. It is game after game after game. While you see that when you’re paying attention to it on television, or you’re a casual fan, when you’re actually thrown into that and have to do it. It gave me a whole different appreciation for what these professional players and coaching staffs and the people that travel in the travel party have to do. I would say those two things were the major part. The rest of it is just basketball and being able to evaluate talent and being able to coach talent. Being able to lead talent. There’s a leadership aspect. That’s all pretty much the same as if you’re running a team anywhere. Tell me about your connection to Mills? Steve and I met on my recruiting trip to Princeton. He was a sophomore at that point, and I was a senior in high school. My host was John Rogers, who’s now the president of Ariel Mutual Funds. Steve was on the team. We met on that recruiting trip and struck up a friendship. I end up going to Princeton, so we are basically with each other every day for his last two years, his junior-senior year, my freshman-sophomore year. On the road, off the road. Socializing. Once Steve graduated, his dad, Ollie Mills — there was a recent story in the newspapers here about his coaching career — offered me a job as my first coaching job to coach at Percy Jackson Youth Center, which he ran. I came up for the summer before my senior year, was able to run the basketball part of the Percy Jackson Youth Center. I not only worked there, but I stayed with Steve at his house. Our relationship goes back doggone near 40 years now. 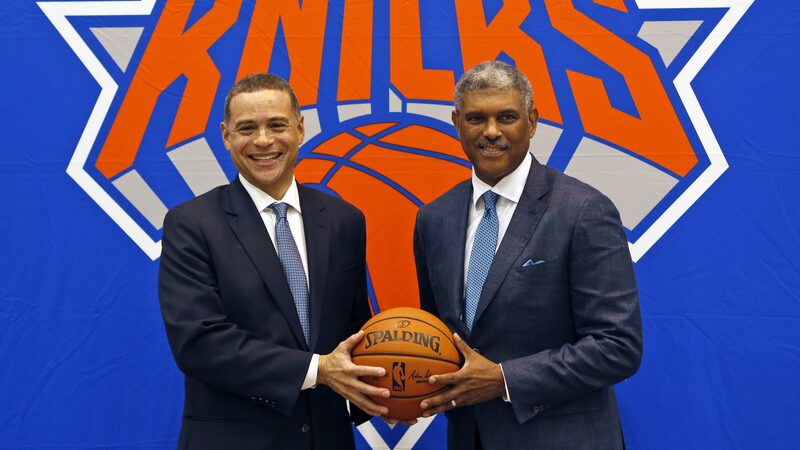 What were your thoughts when Mills was named president of the Knicks last year? I was just excited for him. It just seemed like the next logical role for him. I knew with his wealth of knowledge with both the league, the industry, as well as Madison Square Garden, that he would be a real good person to lead the organization. Now that I’ve been here, I’m even more excited. I just love his vision. I love his style. We’re really excited to get this place going in the proper direction and winning games. Why did you come to the Knicks? Initially I said, ‘Nah, we’re just closing on our house. This would be great.’ I had no idea what the job was. I thought it would be something very similar to what I was doing in Milwaukee. He said, ‘No, just hear me out.’ Once he explained what he wanted me to do, it was one of those things where you had to stop everything you were doing and have a family conference and really take a hard look at it. That’s what led me. It was a combination of the fact that I’ve known Steve for almost all of my life. This was an opportunity to work on the biggest stage there is in this industry, and with such a historically relevant organization like the Knicks, and with a tough task. It’s not going to be easy. If we can all pull this off, this would be something really big and really exciting to be a part of. Did you close on the house? Oh, yeah, we closed. Yeah. We had to. There’s no way. When you go to the closing, it’s all done. Everything’s done. You can’t back out of it. That happens in this business. Being a coach and having worked in corporate America, my lovely wife and family have been very accommodating with all of the moves we’ve had to make. This was just one opportunity I could just not pass up. With this position do you believe you have the ability to change lives or enhance the future of these players? Absolutely. Absolutely. The best part about it for me is that it happens both on and off the court. I think you need to have both if you’re trying to really help players develop. You have to have a say in both sides. The on-the-court stuff is extremely important to these guys. When they realize that it’s as important to you as it is to them, that’s when you can have an impact on their off-the-court lives. They start to trust you and have a relationship with you. That’s when they start listening. Not only black kids or kids of color, young women aspiring to be in a front office one day, when they see or learn more about the Knicks’ front office, what message does it give? What kind of motivation do you think your group brings? These jobs are the best jobs in the world, so they’re extremely hard to come by. But I’m hoping that instead of looking at this and saying, ‘Oh, I could never do that,’ now you see a group of people with a nice, diverse background, including color, but a diverse educational background, a diverse locational background, a diverse cultural background. They realize, if I do well in school and if I’m passionate enough about what I’m interested in, I too can have a chance at fulfilling a dream, even if that dream is not being on the court and being in the front office. Lastly, you, Mills and Perry each have banking experience. How does that help you guys perform your jobs? I think there’s an analytical bend to this game that people are now just sort of paying attention to over the last 10 years that I think if you have a sort of quantitative background that helps you, along with a good ability to evaluate talent. It’s interesting that people are all of a sudden talking about that when there are some of us who have always looked at this sport from an analytical or quantitative point of view. I think anytime there’s stats involved, you will attract guys who are more quantitative and more analytically inclined, like people who used to work in banking.